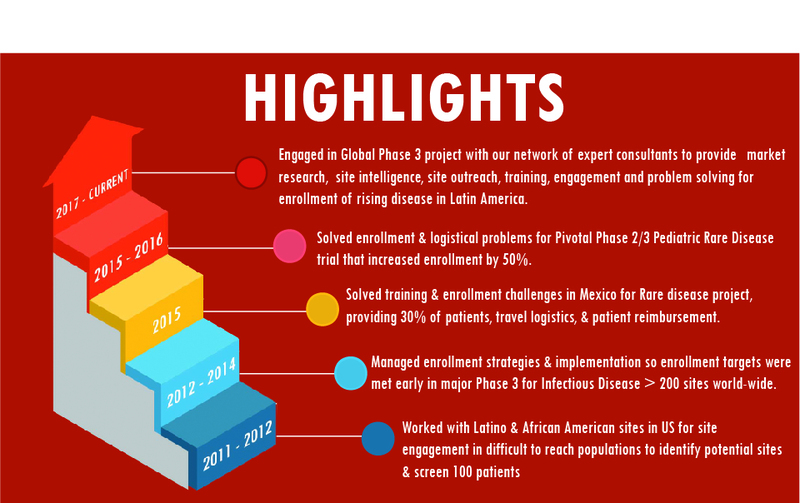 For >10 years our expert consultant network has specialized in Latin America & Latino populations to get enrollment results in complicated trials, including Rare Disease and other medical projects. Our unique concierge approach includes a database network of referring doctors, KOLs, & other venues to solve market research, enrollment strategies & logistical problems for sites, investigators, patients & their families, to gives sponsors the insurance they need to get the job done. We find, form & train teams, including site performance, developing KOLs, conducting surveys, & bringing the right feedback needed in a patient-centric world. When problem solving to uncover why your plan is not working, or when making sure your plan is having success, you want the all of the patient centric programs in place. This can be from proper logistics management to understanding cultural issues or handling special populations, to vetting your team, or improving training. Farmacon can plan & execute a tailored solution to get the job done. By developing solutions for pharmas & biotechs, measurable outcomes are achieved. As research detectives, we rescue studies with the right project management for enrollment, solve supply chain problems, and bring the best strategy and talent to the project. Farmacon, a boutique CRO and consulting group, gets results.